My country is a mountainous district in the Okayama Prefecture Oda-gun Yakage-cho. It is a feature that there are a lot of days of cloudy weather that it doesn't rain in saying that there are a lot of days of fine though it is true to rain little because of the mild weather. Actually, the Tokai region seems to be longer at durations of sunshine. Recorded in the January and March 2010 edition "Gendai-nougyou"
It was published in "Gendai-nougyou". It is a photograph of P276-P277 at the January 2010 issue (sale on December 5, 2009). At first a photograph digging the rock that was buried in the rice field with backhoe is big and, in this article, appears. Next, notes when circumstances, how to buy that I bought the backhoe, and buying it are written. My having bought the backhoe starts from the construction of the house in the place with nothing excluding the field in the country in 1996, too. Afterwards, it tried to construct the soil digging around the house, the soil carrying, the stone wall volume, and the warehouse for myself though it asked the trader for the maintenance of the homesite. However, it came to think that you should buy the backhoe and make it like you when you thought about the cost for which it asked the trader by understanding a too incompetent thing in human strength. 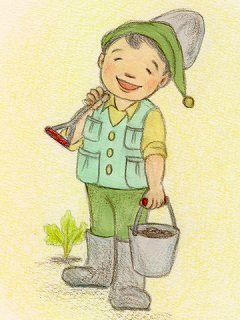 Any inventor whom a right picture Donguri-village makes for myself, and it seems to be a child, and it to be Mr. Edison of the hard worker. This picture was drawn by being the author of blog "Walk Michi of dream". Thank you. The model seems to be me. It has laughed because it is too young because it looks like somehow when seeing for the first time at the same time as being surprised. The image must see by all means a lot in other picture books in the blog of "Walk Michi of dream" the entered wonderful fairy tale. Because clothes often wear the vest with a lot of pockets of my trademark, I think that I became it like this. 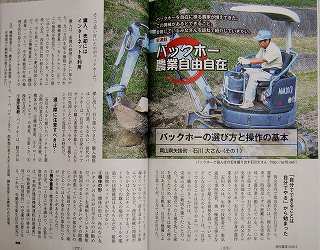 It appeared in the top page of amateur agriculture because it was a style that engaged in farming. Even if it looks like me, I am an uncle who becomes the 60th birthday in 2009. It is not understood whether my ten-years old time was such feeling. We will leave it to the imagination. There are my country of the altitude and about 150m. It is a mountain of above sea level about 260m in the north-northeast and about 250m There is (elevation about 23 degrees), and mountain of above sea level about 331m in about 540m for the south There is (elevation 18.5 degrees). These mountains are windbreaks at the typhoon. However, sunshiny has improved very much because it opens the east and the west comparatively well. It is thought that a lot of we are utopias in the wild bird because air, water, and starry sky are beautiful, and the quiet surroundings. The thing that I take charge of work by aged has increased to father though father had chiefly done agriculture up to now. Because only I had been helping agriculture since child's time, and it was an amateur (amateur) for agriculture, it was named, "HP of amateur agriculture".